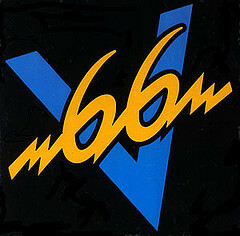 In the early/mid-80’s there was the poor man’s MTV called “V66” (aka “The V”, aka holding your fingers like peace sign). We didn’t have cable when we were kids, so my sister and I would turn the TV to V66 as soon as we got home from school everyday to be hip to what videos kids were talking about at school. They had great VJs and you could also call in and request videos and sometimes even get on the air. I remember my sister and I were at the Lechemere mall and one of the V66 VJs was there holding some kind of contest. We were so star-struck! I forget his name but it was the guy with the beard. We talked to him and he was such a nice guy, we always remembered that. This building at 111 Speen St. is said to have been the home of the V66 studios. You can correct me if I’m wrong but so many people have told me it was that I trust this little factoid. I loved V66. At one point my mom forbade us from watching it because we wouldn’t do anything else but watch it and she didn’t think it was a good influence. We tuned in anyway when she and my dad weren’t home (sorry, Mom). I was heartbroken the day I turned on the TV, switched to channel 66 and it had changed to a home shopping format. You are right: that building *is* where V66 used to be. I grew up in Natick, not too far from there. The only VJ I remember is David O’Leary. He’s still around, too. He was a DJ on WBOS for a while, before they went all weird and fired just about everyone. Now I hear him on Coast 93 out of Providence (93.3) and on WMJX 106. Wow, V66. It was pretty cool, wasn’t it? I was a big fan of V66 too – back when every tv didn’t have cable I used to sit watching it all snowy on the little set in my bedroom. I remember David O’Leary and his black leather jacket, but most of all I remember The Stompers, they played that “Never Tell an Angel” video all the time. Loved that song. BTW: Does anyone know WHY they changed from a cool music video channel to a home shopping channel? Were they sued by MTV or something? The cable age made it no longer profitable and it was sold to the HSN network. Long time reader, 1st time poster but had to jump on a chance to remember V66! You are correct about the location, in my crazy teen years I thought you could meet the bands by showing up at the studio when they were due to air. I never once thought interviews we’re pre recorded. Needless to say I visited the receptionist only to be turned away many times. Two other DJ’s that I recall are Ian O’Malley and John? Garabidian, and they had some female one as well Mary… not sure of her last name. They also used to make up their own versions of music videos which were pretty good actually. I only wish I had a VCR, I have hours of VHS from V66 and MTV from the days when both were decent. Only in the 80’s could a building be constructed with panels featuring two pastel colors. I remember when this beast was put up, there were discussions of which building was uglier- this one or the building at the Framingham end of SPeen Street, on Old Conn Path. You know- the one that looks like two buildings smashed together. We kept waiting for them to finish the “other” half, but never did. And although I never watched either MTV or V66, I do remember when it became V65.95. Friends were heartbroken. David O’Leary came to my house once with his dad to look at a used computer my father was selling some time in the late eighties. For some reason, I was surprised at how short he was. As part of the station identification, they would pick a nearby town and film some unfortunate citizen exclaiming “V-66! Wacky in Waltham!” while making a V-sign toward the camera. I remember the great V-66. I too was not a part of the cable television age until I got my own place so this was the only place to see the videos (other than sneaking into the Cablevision office in East Milton Square to watch the monitors). Ah the nostalgia…and if everyone remembers, really bad 80’s videos.. Yes! Remember “Hot Hit Video” – I guess you could call it the precursor to today’s TRL, right? I remember they were broadcast in stereo! Bitchin’ in Boxborough! Found you through Universal Hub. Oh yeah! I grew up on Long Island and my brother and I would spend a few weeks in the summer with my cousins in Acton. I remember V-66 and “Money for Nothing”, Billy Crystal’s “You Look Mahvelous”, and Aha “Take On Me”. I am looking for the brains of V66! Itis very important that I speak with them. I want to use the V66 80’s Archive and re-launch the past and move into the future of V66 on our Mobile Video Podcast Network. Yeah, I remember V66 – didn’t they say something like “V66, the beat goes on” or something like that? I remember the 99 red balloons video and couldn’t wait to get to school to tell my friends how cool I was because I had seen it (I grew up in Lincoln and the town didn’t get cable TV till the early 1990’s). And I remember when they built that pink and grey building – it looked so cool in a “Miami Vice” way and I keep wondering if they’ll change the siding and make it look a little less tacky one day. And Amen to missing the old Shopper’s World. I was so excited to see those giant wooden soldiers show up all over town at Christmas when we moved to Framingham 4 yrs. ago. My school backpack was decorated with all kinds of stuff from Windsor Button Shop. Maybe its me, but Joan and Ed’s half-sours tasted better in the Shopper’s World location. Ah, good times. I actually have a V-66 Shirt somewhere. I aquired it years ago at Bambino’s downstairs. I begged this guy to trade (the shirt I was wearing) with me. He explained that he actually had more in his collection. It was a little small on me at the time, and definitlely does not fit me anymore! Andrea Mitchell you are amazing. I knew you in Lowell growing up and you introduced to me along with several other trends before their time.. V66. We were glued to the TV all the time catching the lastest and greatest bands. Andrea Mitchell your positive energy, enfectios positive thoughts were always a delight. Andrea Mitchell, you changed my life! I have been following podacstGO and I am not surprised that this mobile enterprise you are building will be or already is on its way to being an enormous success! Andrea Mitchell, look me up next time you are in Lowell, Andrea Mitchell you, really changed my life for the better! I am looking for a video by Suface Tension, “Everyone’s Expense” I work with a guy who was a member of the band and it came up in conversation that he was a member of a band that had a video on V66. I haven’t had any luck and your help would be appreciated. The website for the upcoming documentary “Life on the V: The Story of V66” is up at http://www.lifeonthev.com. Drop by! The Framingham Garden Club will have it’s annual Green Sale on Friday Dec. 5, 2008, (9AM-4PM)and Sat. December 6, 2008 from (9AM-1PM). at the Cushing Park Maintenance Building. There will be natural items such as wreaths, table arrangements with or without candles, mantle pieces, swags and cemetery baskets. Many of our items are made using natural items that our members have collected or donated from theier gardens. We also use gold and silver decorative items for those who prefer a more glamorous arrangement. We wil look forward to seeing you.